The best tabletop RPGs prove that the time-honored tradition of rolling dice and telling stories with your friends is alive and well. They take a little more time commitment and schedule arranging to get started, sure, but for putting in that effort you'll be rewarded with unforgettable stories that always turn out better than you could have possibly planned. Whether you want to make a world all your own, run through a convenient pre-published adventure, or take an established setting and tweak it to your heart's content, these are the best tabletop RPGs for the job. 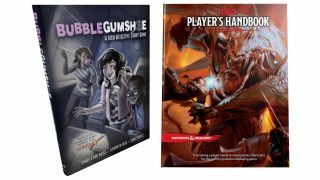 Many of the games on this list (and beyond) use polyhedral dice, and this deal will get you six different colored sets with their own storage pouches to boot. Four decades, hundreds of books, and a handful of ill-advised cinematic adaptations after it first arrived, Dungeons & Dragons has never been stronger. The fifth edition of Dungeons & Dragons arrived in 2014 with a renewed sense of streamlined adventure across three core books. All you need to play is a set of polyhedral dice and a copy of the Player's Handbook - in fact, you can get by with the free, basic rules from D&D's website - but the other two core books will come in handy for running your own campaigns as a Dungeon Master. Since D&D 5th Edition came out in 2014, publisher Wizards of the Coast has shipped a number of other official books including the Sword Coast Adventurer's Guide and Xanathar's Guide to Everything (not to mention a series of nicely designed and illustrated pre-made adventures). They're worthwhile, but don't worry about investing in all of that at first. Take your time to savor the ways that D&D 5E finds the sweet spot between sensible systems and creative charm, creating a role-playing system that has a rule when you need it but gets out of the way otherwise. Best for… groups who love classic fantasy adventures with a mix of dice-rolling combat and role-playing intrigue. Blades in the Dark is the most focused game on this list: it's the story of a gang of scoundrels who try to carve out their own piece of a big, dirty city. The details of who they are and how they go from small-time crooks to bosses of the underworld (or die trying) are up to you. It may sound limiting - and certain game mechanics, such as territory acquisition, feel more like a board game than a TRPG - but Blades in the Dark pushes that narrow remit to its fullest potential. The fresh way Blades in the Dark thinks about RPG systems is encapsulated in the "engagement roll". Rather than letting players get bogged down in the limitless what-ifs of planning for a fictional situation, the game master asks a few questions, player responses build a dice pool, and the result determines how well the players are doing when you cut straight to the action. Additional details can be added in-medias-res via flashback scenes. I haven't even gotten into how much I love the balancing act of Position and Effect, pushing players beyond leaning exclusively on the biggest numbers on their character sheets, but I could go on. Best for… players who are willing to approach a brilliant game on its own terms. Don't let the name fool you: Feng Shui 2 has nothing to do with interior design. It's a tabletop RPG ode to classic Hong Kong action cinema - the kind of movies you catch playing on TV at midnight and end up accidentally marathoning past dawn. It's built to make you feel like you're playing a guns-blazing John Woo crime drama, a kung fu period piece with cheesy costumes and fantastic fight choreography, or much stranger fare (four words: post-apocalyptic battle apes). This is not a game to play if you want a realistic police procedural. Feng Shui 2's built-in setting throws together archetypal heroes from the past, present, and future in the "Chi Wars," a secret magical conflict that rages across nations and human history. In practical terms, it's an excuse to tie together sessions with hardboiled crime adventures and ancient demonic summoning rituals all into one campaign. However you can easily disregard the supernatural elements if you prefer, especially for one-shots. Either way, the genre-emulating mechanics will be just as strong - especially those rules for chase scenes. Mmm. Best for… action aficionados who want to say "I can't believe that worked" at least five times per session. If you enjoy Nancy Drew or Veronica Mars and think it would be fun to play a tabletop version of them, you should stop reading this review right now and buy Bubblegumshoe. If you're not sold on playing out your own teen drama of sleuths solving mysteries and getting into trouble, you may yet be convinced. Bubblegumshoe is probably the family-friendliest game on this list, but don't let that fool you into thinking it's only fit for the kiddie table. Bubblegumshoe will feel familiar if you've played other investigative games like Trail of Cthulhu. However, it makes a few brilliant changes that reinforce the teen mystery feel and may be tempting for gamemasters to repurpose for any other social-focused game. Relationships with non-player characters are codified into skill-like stats, letting players call on friends or loved ones to help out in a jam - or even throw them under the bus to deflect a serious hit to their Cool (think HP for your social life). Did I mention all conflicts are called Throwdowns, and they make trading hallway putdowns or dance battles just as dangerous and dramatic as fistfights? Yeah, Bubblegumshoe's great. Best for… living out your own high school dramas where you're always the brilliant hero. Even if you only have a passing interest in Gene Roddenberry's optimistic vision of our future, Star Trek Adventures is a well-designed tool for creating teamwork and triumph among the stars. It typically focuses on the bridge crew of a Federation starship (the Next Generation era is the default setting), with each player character occupying a position like operations officer, security officer, or captain. The game system also empowers players to quickly create and play supporting characters as needed - so nobody's stuck playing the medical officer for an entire injury-free session. Clever rules for extended tasks, like retrofitting a shield emitter or negotiating with testy Romulans, make non-violent conflict resolution just as fun as trading phaser fire. It can sometimes be unclear when to use each character's 12 stats - always picking one stat each from two sets of six for a roll - but that also encourages experimentation and unique approaches for all manner of activities. If you can imagine it happening in an episode, Star Trek Adventures can make it fun for you and your crew to play. Granted, those custom six-sided "Challenge Dice" are a little silly. Best for… players who like to cooperate and can start a session with the words "Captain's Log: Stardate..." without anybody cracking up. Tabletop RPGs are all about imagination, right? So maybe you want to collaboratively imagine your own world with a group of friends then dive into a campaign. Fate Core does that. It's a setting-agnostic system that's focused on two things: being customizable as all get out and fostering player-focused narratives. Honestly, so is Fate Core's rules-light counterpart Fate Accelerated Edition - all in a friendly booklet you could read in half an hour - but Fate Core has more options built in. Fate Core's worlds, campaigns, and characters are given life by aspects, short phrases that say something about what makes them unique. You could invoke your "Short-tempered soldier" aspect to get an edge in intimidating an opponent, but then the game master could compel that aspect to tempt you into an inadvisable brawl. It's all managed with an economy of Fate Points: playing to your character's traits in interesting ways will earn you points which you can then spend to get out of trouble or otherwise have more control of the story. It's smart from top to bottom and strong enough to overcome a few areas where rules could be clearer... like what the heck is a boost, anyway? Best for… rolling your own world and focusing on storytelling over statistics. Dungeon World loves taking rusty fantasy tropes and sharpening them to a singing sheen: adventuring can be just as lethal as a 1978 dip into the Tomb of Horrors, but your stricken character could make a grim bargain with death itself and rise again. Uncertainty is resolved with a two six-sided dice plus a single applicable modifier. Roll high enough and you get to do exactly what you wanted! Any lower and, well… there are tables for that. Oh yes, tables - full of hard choices that push the story forward but probably not in the way you intended. Dungeon World wants everyone, including the game master, to "play to find out what happens". All the GM has to worry about between sessions is setting up a handful of "fronts" that act on their own out in the world, then the system will remind them when to make a move on the fronts' behalf. Dungeon World is a swords-and-sorcery "hack" of Apocalypse World; if you like the sound of its overall philosophy but are tired of fantasy settings, give other "Powered by the Apocalypse" games like Monsterhearts or The Sprawl a try. Best for… hacking, slashing, and finding out what happens. You don't have to know Starfinder is the sci-fi followup to Pathfinder to enjoy it. You just have to like laser swords and ship combat and strange alien species and, ideally, a wee bit of fantasy mixed in with your sci-fi. Starfinder uses a familiar array of stats to modify your usual D20 attack and ability rolls, and it also leaves the door open to bringing in straight-up space dwarves and space elves if you can't stand to role play without them. However much you want your campaign to feel like Pathfinder in space, new ideas like character themes - which emphasize your place in the galaxy, not just how you fight - and the health/stamina system ensure Starfinder plays like a game of its own. It's also streamlined… a bit. Starfinder's core rulebook is still a meaty 528 pages. At least they're a well-designed and lavishly illustrated 528 pages. One last word on Pathfinder: feel free to check it out, but don't start buying up dozens of sourcebooks if you aren't already committed. A second edition of Pathfinder is deep in playtests right now and there's a good chance it will be out officially by the end of the year. Best for… going on detailed space adventures with a little fantasy flare. The tagline for Fiasco sells it: "A game of powerful ambition and poor impulse control." It's about building and playing through your own imaginary criminal caper movie, directed and acted by you and your friends instead of the Coen brothers and John Goodman. Fiasco's also the only game on this list that doesn't require a dedicated game master role. There are rules and dice rolls to help create interesting situations, but it's up to everybody playing to make sure the story stays pointed in an entertaining direction. Therein lies Fiasco's greatest strength and its greatest liability. If your friends buy into that 'powerful ambition and poor impulse control' premise, you'll have a good time. If they're into all that and are good at improvising cinematic scenes, you'll have a fantastic time. But Fiasco can easily stall if anybody insists on keeping things sensible or squabbling about how many bearded dragons you could really fit under your shirt without a customs officer noticing. Thankfully the book is pretty cheap and all about one-shot sessions, so it's worth keeping on hand just in case the conditions are ever right. Best for… playing through heinously bad ideas with funny people. Numenera is a grand game. It's set on a huge world with billions of years of history, and it has equally sweeping ideas about how to design and run an RPG. Players create explorers of the Ninth World (for reference, you and I live in the First World) and they journey across familiar yet alien lands, finding ancient artifacts that seem like magic to them but are probably just smartphones or killer nanobots. On the other side of the table, Numenera reduces the game master's typical workload while loading them up with options: monster stats begin and end at their level but ample descriptors can still make each one feel unique; "Game Master Intrusions" offer a codified way to make impromptu changes to the story without squashing player agency. Numenera has been around since 2013, but in 2018 it got a new pair of corebooks (Discovery and Destiny) that lightly revise and reorganize its rules while adding a bunch of new options. Both are thoughtfully designed and gorgeously illustrated, though you only need Discovery to start playing or running your own campaign. Best for… wild, weird fantasy adventures that give both the GM and players narrative control.